New! The Non-Surgical Face Lift. Dr. Brown is the only doctor in the area to offer this new and amazing anti-aging treatment to lift sagging facial skin. Silhouette InstaLift is a simple in-office procedure to re-contour your face by lifting the deeper layers of your skin with tiny sutures. For a more youthful appearance, it is considered the best non-surgical facelift. During a short in-office procedure, and using local anesthesia, Dr. Brown will insert the patented Silhouette InstaLift sutures to lift the deeper layers of the skin in your mid-face or cheek area. The whole procedure typically takes 45-minutes. You will see results right away and the recovery time is minimal. The unique Silhouette InstaLift sutures are naturally absorbed by your body over time while stimulating the production of collagen for natural-looking, long-lasting results. Silhouette InstaLift™ are fully resorbable sutures that lift and help increase volume and restore contours to the mid-face and cheek area. Over time, the implanted sutures and cones stimulate collagen production to restore volume to the mid-face for natural-looking, long-lasting results. Sagging facial skin is one of the major contributors to an aged and tired appearance. Silhouette InstaLift is ideal for men and women who are interested in a natural-looking, more youthful appearance without major surgery, injections or lasers. 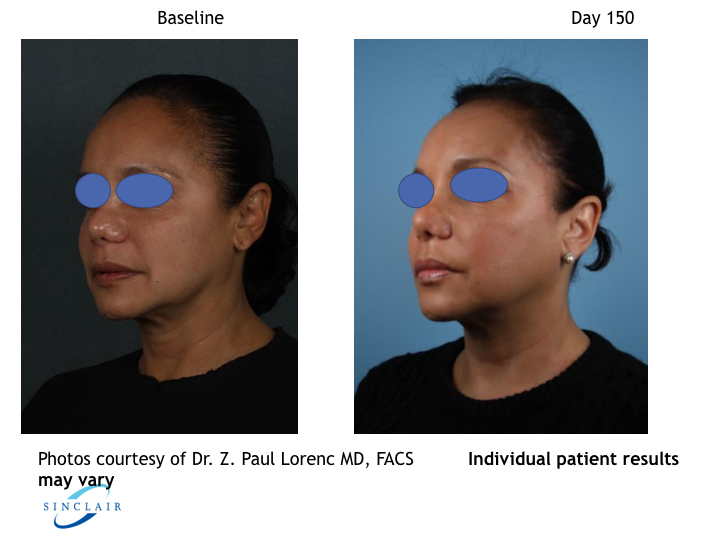 It offers a new and unique technology to lift sagging facial skin. Is The Product FDA Cleared? Yes, the product earned FDA-clearance in April 2015. What Are Sutures Made From? Silhouette InstaLift sutures are made from glycolide/L-lactide (PLGA), a polymer that is frequently used in medical devices and is well tolerated by the body. This polymer builds new collagen while it is in the skin and provides long-term lifting even after the sutures have dissolved. The fully absorbable sutures have bidirectional cones that provide both lift and excellent anchoring to the subcutaneous tissue. What Area Of The Face Does It Help? The procedure lifts, increases volume and restore contours to the mid-face, cheeks, and jowls. No, we use local anesthetic to numb the area before inserting the sutures. During the in-office procedure, Dr. Brown will begin by marking the areas of desired lift on the face. Then, she gently inserts a needle through the subcutaneous tissue to the exit point. The sutures have bidirectional absorbable cones that hold them in place. The treatment is well tolerated by patients and typically takes one hour. How Does It Differ from Thread Lifts? Silhouette InstaLift is an entirely new technology and procedure. Rather than temporarily moving the surface of the skin with hooks and barbs, InstaLift™ repositions the underlying layers of the skin with patented, bi-directional cones. 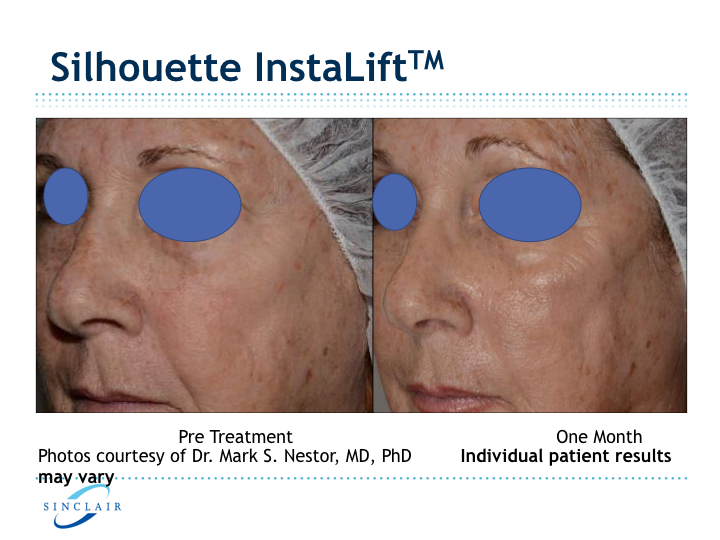 Another very important advance is that InstaLift is fully resorbable and not permanent. As the InstaLift™ sutures and cones are resorbed, they stimulate collagen renewal, which helps increase and restore volume to the mid-face for natural-looking, long-lasting results.